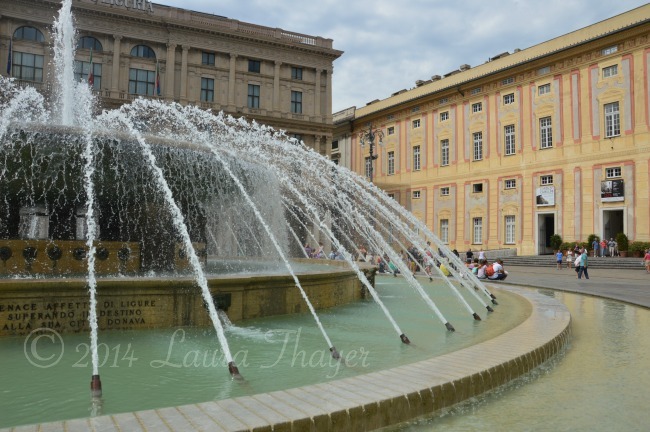 Earlier this summer I spent a marvelous and weekend in Genoa at the A New Way of Seeing Photography Retreat. The dates for the upcoming autumn 2014 workshops have been announced, which I’ll include below. If you’ve upgraded to a DSLR and have been wondering what all the bells and whistles (no, there aren’t actually whistles…) do and how you can take your creativity to the next step, then this is the workshop for you. Because it’s not just about photography, it’s about what we create and what we see when we pick up the camera. It’s about what comes from within just as much as what you capture with your camera. If that sounds like the way you approach photography and life, then you’ll treasure the experience of this photography workshop. If you haven’t fallen in love with the beauty of Genoa yet, this gorgeous video will give you a glimpse of all there is to discover. The workshops are each a small group of women and spaces are limited. It’s a unique and very personal! 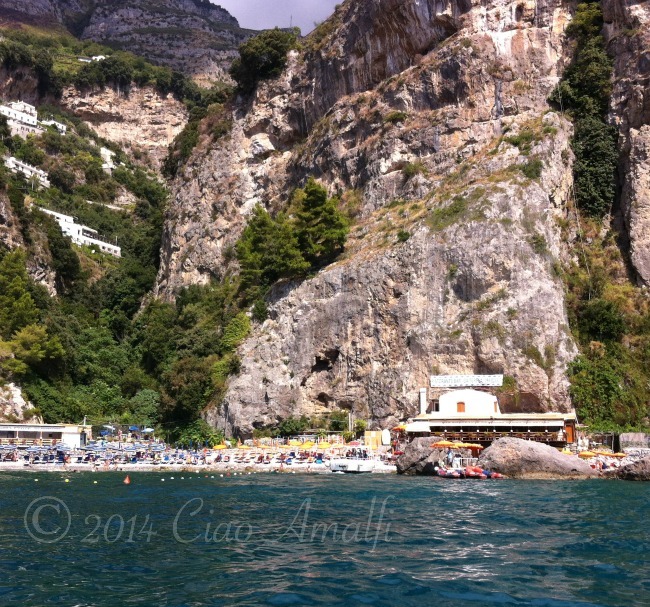 I’m sharing about it here on Ciao Amalfi because Di has become a dear friend and it was a remarkable experience. I wish that anyone interested may have the chance to find out more about it! If a photography workshop is something you’ve been considering, head on over to the A New Way of Seeing website to read more. Have fun … and say hi to Genoa for me! 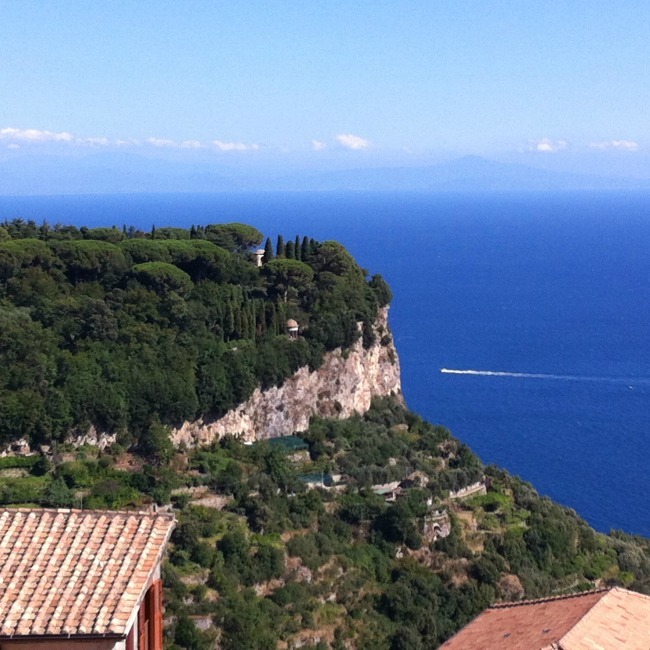 Oh, it’s good to be back home on the Amalfi Coast. Since moving here many years ago, I’ve never traveled back to America in the summer. After enjoying warm weather, sunshine, fresh picked sweet corn and BLTs in Nebraska, I realize what I’ve been missing. But then I come home and see colors like this and I remember just how sweet summer is here, too. (But, unfortunately, without corn.) The weather has been gorgeous this past week, showing off the best of summer with temperatures not too hot, a sea breeze and relatively low humidity. We couldn’t ask for a better last hurrah of summer. This picture reminded me of the famous song “Volare,” which is the popular name for “Nel blu dipinto di blu.” The name translates to: “In the Sky, Painted Blue,” and was written by the great songwriter Domenico Modugno. I shared it earlier this week on Instagram. 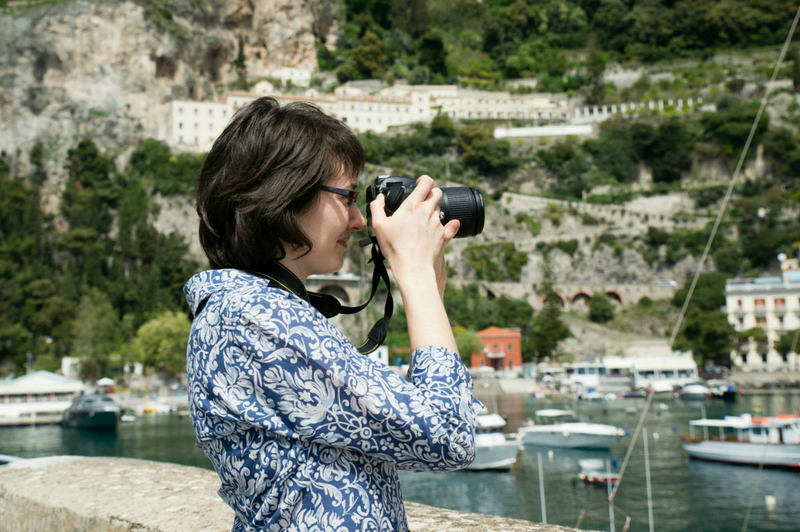 If you’re on Instagram, you can find me @ciaoamalfi, where I share photos of the Amalfi Coast, Toulouse being cute and a variety of cooking adventures. 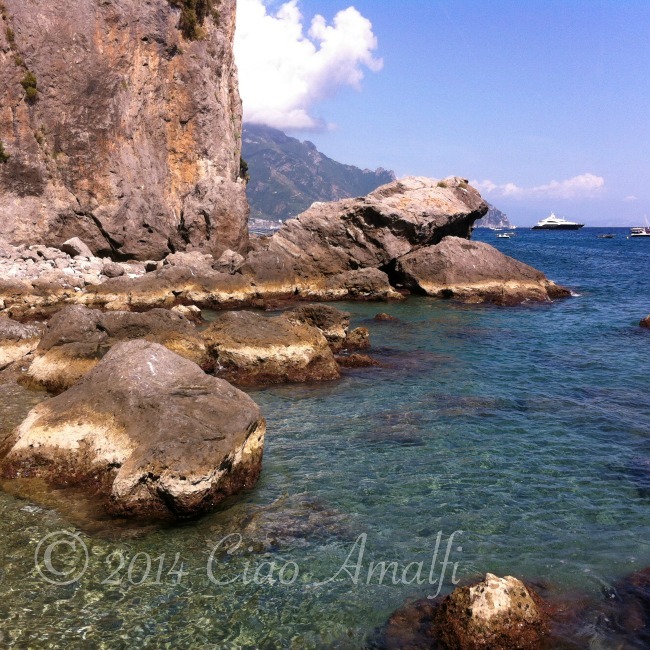 Anyone who has spent time on the Amalfi Coast or lived here has a favorite beach. The beautiful beaches and tiny little coves that dot the coastline certainly can make that a hard decision. While I have quite a few that would be contenders, there’s only one that could be called my favorite – the Santa Croce beach. Located just a short boat ride west of Amalfi, it’s isolated enough to feel far away from the world, but still relatively quick and easy to reach. 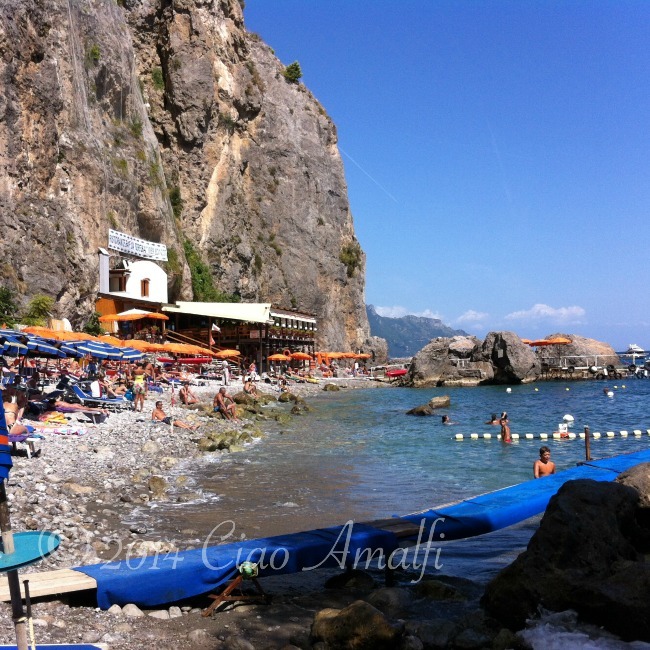 There are two restaurants with beach access at Santa Croce–Ristorante da Teresa and Ristorante Santa Croce–and they both offer boat service back and forth from Amalfi if you are dining at the restaurant or renting a sunbed for the day. 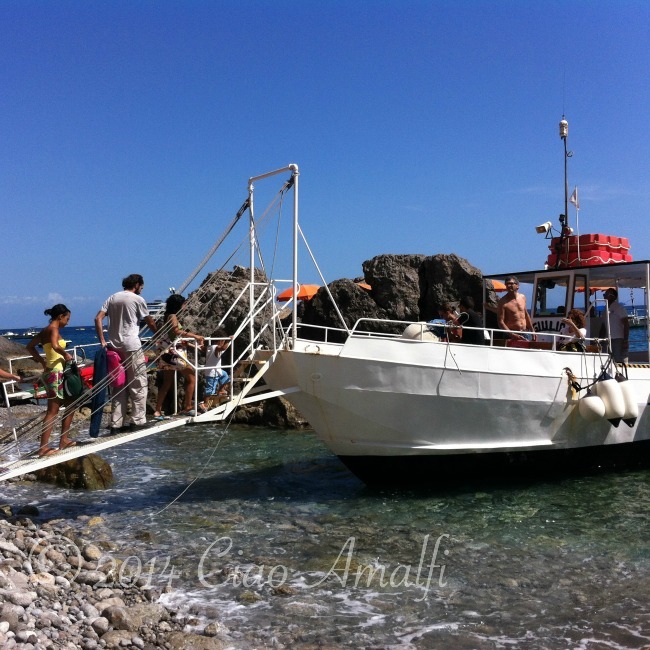 For a small fee, there’s also a separate boat service to Santa Croce if you’d just like to throw down a towel on the free part of the beach (beware … very large stones!) or want to get to the beach on a larger boat. There’s a ramp on the front of the boat that drops down to the beach. 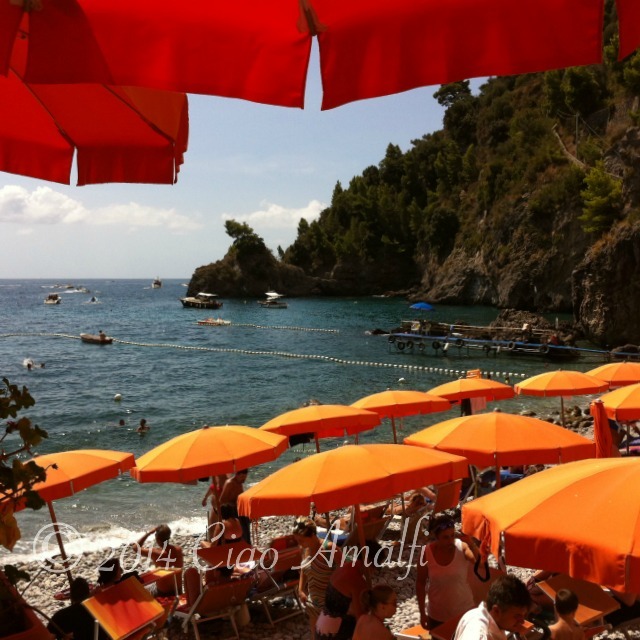 We’ve always gone to Ristorante da Teresa, which you can spot from the sea with its bright orange umbrellas. They have a covered dining patio for relaxing meals overlooking the sea, or you can eat on the beach as well. 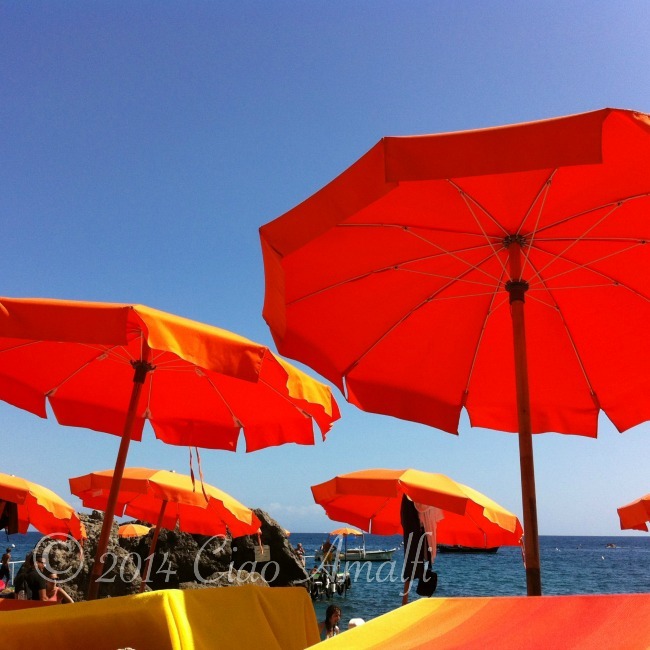 I’m in love with the orange umbrellas and their shocking color against the clear blue sky. I could lay and look at them all day long. (Yep, I’ve tested that.) Deep down in my soul I must have a thing for complementary colors. 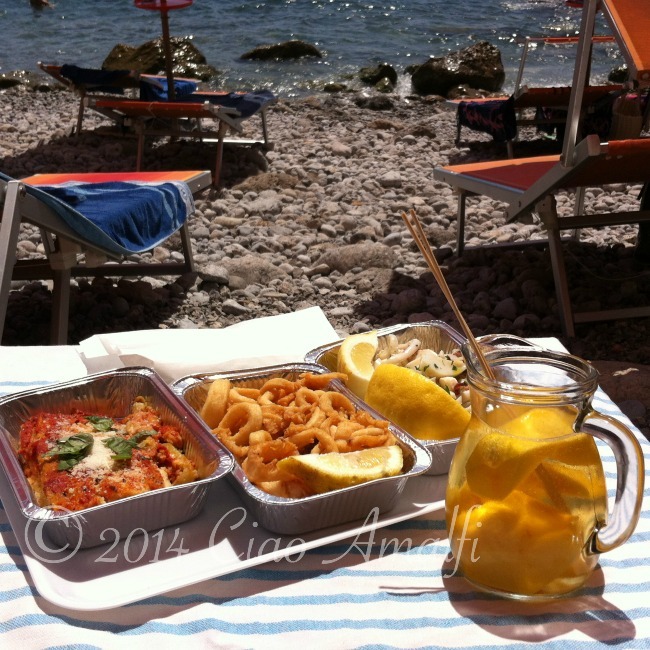 Oh, and I definitely have a thing for beach picnics at Santa Croce, especially when they involve fried calamari with a dose of freshly squeezed Amalfi Coast lemon, insalata di mare and a most divine parmigiana made with zucchini instead of eggplant. And the summer essential – refreshing white wine with slices of sweet peaches. 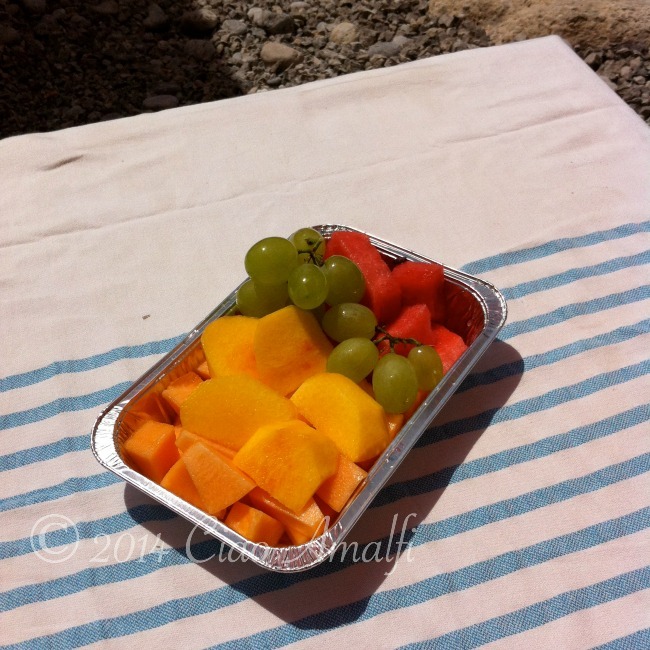 What better way to finish off a beach picnic than with fresh fruit? Ristorante Da Teresa also does excellent panini and the restaurant is out of this world for fresh fish. Even if you’re not a beach person, you can enjoy the boat ride to the restaurant and dine overlooking the sea. 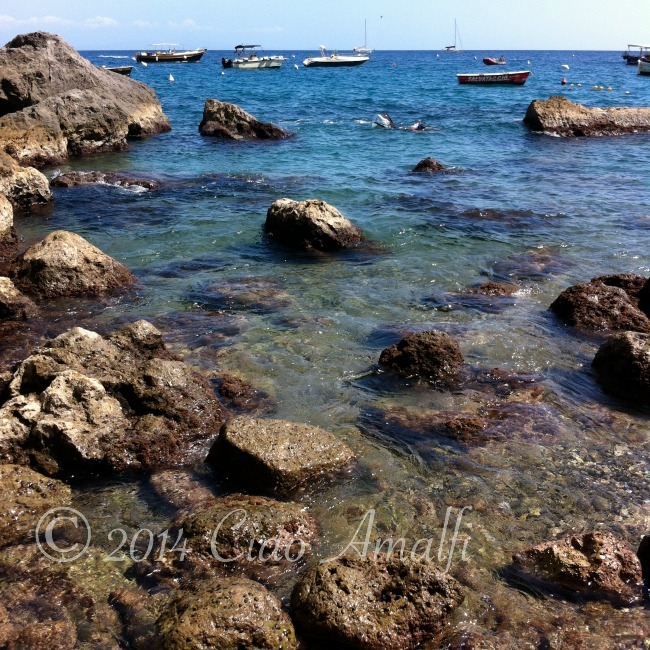 The beach at Santa Croce is not for the faint of heart as it’s quite rocky. Adventurously rocky. 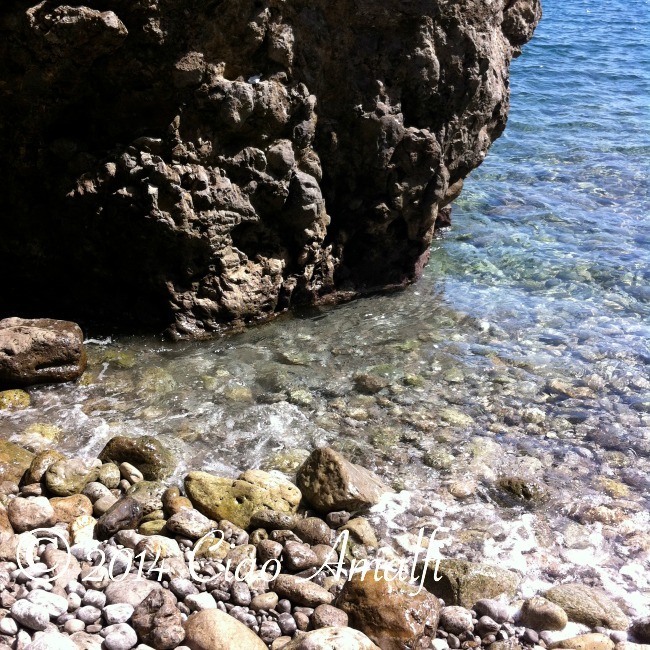 I love exploring and climbing over the rocks along the beach, perhaps even more than swimming in the water. It opens to the most beautiful views of impossibly blue pools sparkling in the sunshine. Look closely and there are tiny crabs crawling over the same rocks and lots of other little things to discover. After a bit of climbing and swimming, it’s back to the sunbed to enjoy a view like the one below. This is good for the soul. Very good! It has been a rare experience over this busy summer and with my recent trip back to America. But when it’s rare it’s even sweeter somehow.